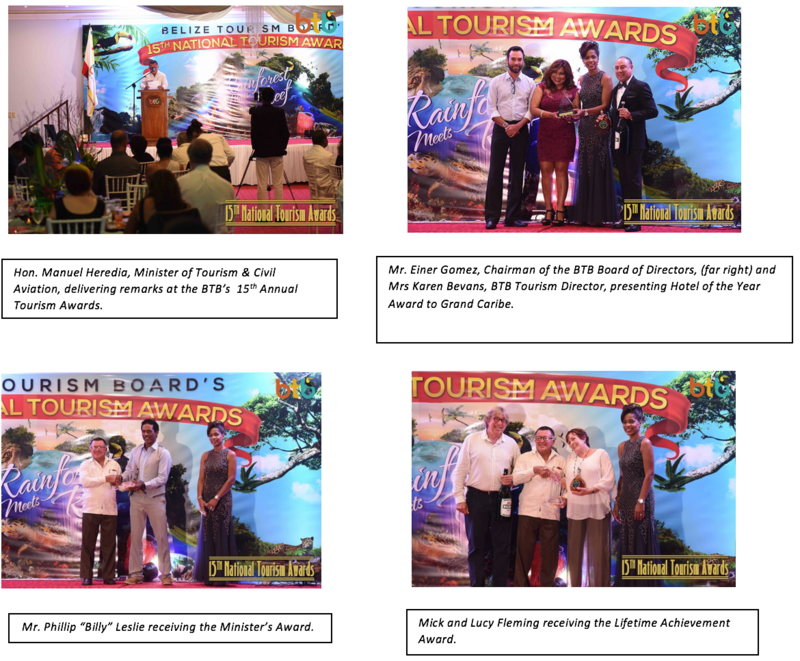 Belize City, Monday, October 23rdth, 2017 – The Belize Tourism Board (BTB) held its highly anticipated 15th National Tourism Awards Gala Event on Saturday, October 21st at the Ramada Belize City Princess Hotel. The event was well attended with guests coming from all regions of Belize. Distinguished guests included, Hon. Patrick Faber, Deputy Prime Minister, Hon. Manuel Heredia Jr., Minister of Tourism & Civil Aviation, and Mrs. Kim Simplis Barrow, Special Envoy for Women and Children, among others. The 15th National Tourism Awards was an elegant celebration of the accomplishments made throughout the year by tourism partners and friends. 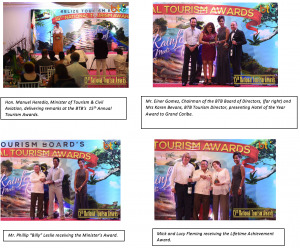 The BTB is honoured to host such a significant event which gives recognition to Belize’s tourism stars in the areas of Frontine Personnel, Hospitality Award, Hotel of the Year, Small Accommodations of the Year, Tour Guide of the Year, Tour Operator of the Year, Restaurant of the Year, the Minister’s Award and the Lifetime Achievement Award. The nominees, through dedication to the industry, have contributed to the quality services offered throughout Belize.